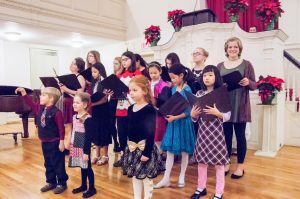 The Training Choir consists of boys and girls grades 2 through 4. No previous singing experience is necessary, and members who do not regularly attend our church are welcome. Weekly Sunday rehearsals focus on vocal development, reinforcing choral habits, reading music, and enjoyment of the choral experience. Throughout the year, the group is introduced to a variety of music styles and periods and will learn skills such as singing in parts. These young choristers begin to understand their importance to our worship by leading hymns or anthems approximately twice per month during the Sunday service. An extra singing opportunity– such as participating in a show or larger choral work– is often part of each choir season. The Training Choir is under the direction of Jennifer Shaw. Come to Rehearsal: Sunday mornings, 11:00-11:45 am in the Choir Room. No sign-up required, come as you are!